If necessary, trim the white tendons from the chicken tenderloins and cut each one crosswise into quarters. Place the chicken in a mixing bowl and drizzle with the olive oil. Add the chili powder, cumin, 3/4 teaspoon of salt and a few grinds of black pepper. Combine well and set aside to marinate while you prep the other ingredients. Heat a large frying pan over medium-high heat and add the chicken. Sauté, stirring often, until the pieces are lightly browned, 2 to 3 minutes. Stir in the chicken broth, bring to a simmer and continue cooking just until the chicken is no longer pink in the center. Do not overcook. Using a slotted spoon, transfer the chicken to a clean mixing bowl. Leave the remaining broth in the pan and reduce the heat to medium. Add the riced cauliflower and salsa and combine well. Cook over medium heat until the cauliflower is tender, 2 to 4 minutes, then transfer to the bowl with the chicken, combine and set aside. Wipe out the pan and coat the bottom with a small amount of vegetable oil. Add the onion and sauté over medium heat until softened, 2 to 3 minutes. Add the garlic and sauté just until fragrant, 1 minute longer. 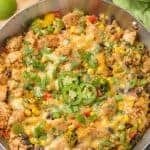 Add the bell peppers to the pan and continue cooking, stirring frequently, until crisp-tender, 3 to 4 minutes, then add the jalapeño, corn, black beans, scallions and about half of the cilantro. Add the chicken-cauliflower mixture including with any juices that may have accumulated in the bowl and combine well. Drizzle with lime juice, scatter the cheese evenly over the top, cover, and heat just long enough for the cheese to melt, about 2 minutes. Garnish with the remaining cilantro and serve with wedges of lime.